Hello world and welcome once again. Nicely cool here in our region at the moment. We're in the grip of winter but I can tell you this....our winter here isn't as cold as it might be anywhere else on the planet. Current temperature in around Yarrabah and Cairns at this time is a beautiful 23.C/74.F. Not bad for the northern tropics. However, this has got to be the coolest weather we've had here for the last ten years, as opposed the usual 28 - 30 degrees most winter periods. Mild, cool, sunny blue skies and quite pleasant at this time. That's Australia fro you. Well, that's the weather report done. If possible, I'd like to read from you about what's happening at your end of the world too. Now, my blogs are all about online marketing and if you're wondering what online marketing is all about, let me give you a basic rundown. This exercise is about promoting either promoting products for someone else, or maybe promoting products of your own that you've purchased yourself, like MRR (master resale rights), and bear this in mind folks, MRR products do not cost the earth to buy online. But, when buying online, beware of scams. Please conduct your own investigation of the website or company you're buying from first before purchasing anything online. I joined up with "12-second-commute" late last year (2013) and haven't been back to the site until just recently. Events at home, prevented me from my online business. But now, I'm doing some rigorous promotions of 12-second-commute. A beautiful website with all the relevant tools at your disposal. For no more than ten dollars ($10.00 USD), you get an entire year, (a full 12 months) to use all the tools made available to you through the members area of the site. People, this was the opportunity I was looking for all my life. This is a simple chance to actually break the chains of our own slavery "Leo", and make a decent break for freedom and the good life that we want for, not only ourselves, but for our childrens' sake. Like I said, I've only just started back with "12-second-commute", after purchasing into the system late last year, so now is the time for me to make or break. Come along and check out the site even if you don't wish to buy into the system. But I will tell you this, for only $10(USD) for a full year membership to try out everything that this site has to offer?....I think I gotta have rocks in my head if I didn't take this up. Anyway, thanks for reading and I'll see you all on my next blog. No!! !...I am NOT a member of the bored. Hello world. Nice of you to visit my li'l ol' blog site here. Sorry 'bout the pic next door there. Didn't mean to look like I've got nothing to do with my time. When we get older, we tend to look....and feel a bit laid back. I'm just chilling out here. And if you're looking at the sarong behind me there, no I'm not Fijian either. I'm from a small town called Yarrabah, located near Cairns in north Queensland, Australia, on a beautiful stretch of beach coast. Sorry I haven't got any pics of Yarrabah or Cairns at the moment but there will be soon. Anyway, I'm basically blogging to promote products in online marketing. From the information I've gleaned from the gurus over the last few years, one of the best forms of promoting products online is by blogging. Hey!!! !....that's what the gurus reckon. Well, from the very beginning, it's been drummed into us that we should go to school, get that education, and eventually relinquish our freedom to the good ol' nine-to-five. YERP!! !...that's right. We were, all of us, born to slavery and tied to the nine-to-five. 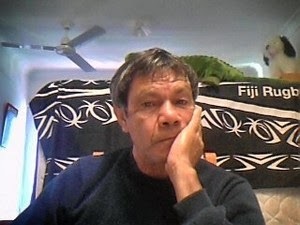 I am 56 years old people, but I got to retire early (yes I'm retired), because I joined the army before a certain period before superannuation became a real animal. however my retirement payout just isn't enough to do what I really want to do. GEEZ!! !...I'm too old for the general workforce now anyway. I go there, apply for a job, and regardless of my skills, I gets turned down as soon as I mention my AGE!!! !...whut thaaa #@%&!!! !...oh and before I forget, if you've got too many good skills to show on your resume, you're OVER-qualified and you won't get the job. I don't know about you, but I'm done going out to dig holes, move someones furniture, or bust-a-gut in a paddock picking fruit and making the other feller filthy rich. It's time to break free...I want to break freeeee!!! (Freddy Mercury/Kiss). That's what I'm doing as of now people...breaking free, and you're quite welcome to follow my lead if you like. This is where it starts. Hope to see you again at my next-page post.